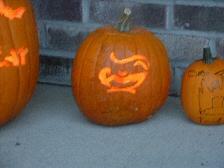 Jini Pumpkins turned out to be a lot more popular than I though they would be when I carved them last year. It was fairly easy to do. I just took the logo, taped it on the pumpkin, outlined the design through the paper, and then cut it all up. It took a while, but it looks pretty good. I don’t know how I missed this site, but I ran across The Fuselage a few days ago. Well worth seeing, if you’re a fan of LOST. I’ve written up some theories on the show LOST, and moved them to their own pages instead of making them posts. I’m doing this for a couple of reasons. First, if you don’t want to see spoilers, then you won’t accidently view them by just going to the home page. Second, I’m writing it all up now so that later I can compare how very very far off I was. You can access the pages on the right in the side bar, or go to the LOST theories page. Jerry Juhl has passed away. He was one of the original group of people that worked with Jim Henson on “The Muppet Show”, where he served has head writer. I exchanged e-mail with Warren Bell over the weekend about the show LOST. I decided to write up a page about my theory on what’s going on in LOST. If you’re interested in the show LOST, but haven’t seen it yet, please don’t read the page. There are many spoilers. For the rest of you, I’d be interested in what you think. Bob Denver, TV’s Gilligan, died Friday. Nintendo announced that sales of Nintendogs have been extremely good, with 250,000 copies sold in the first week.